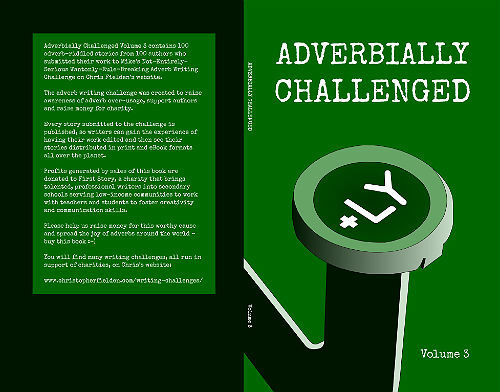 I'm proud to present Adverbially Challenged Volume 3, the third book in the Adverbially Challenged Series, making this our first writing challenge trilogy. Who'd have thought it would come to this, when Mike and I had a discussion about the 'rules' of writing and how much fun it might be to invite others to break them? The book was officially launched on Saturday 17th March 2018. It contains 100 adverb-engorged flash-fiction stories, written by 100 authors (a first for the adverb anthologies, as the first two books were released prior to the '1 story per author' rule) who submitted their adverbially-encumbered tales to Mike’s Not-Entirely-Serious Wantonly-Rule-Breaking Adverb Writing Challenge. Adverbially Challenged Volume 3 is available from Amazon in print and Kindle eBook formats. Proceeds from book sales will be donated to First Story, a UK charity that helps improve literacy in low-income communities. You can learn more about that in the 'about the anthology' section below. You don't have to own a Kindle to read a Kindle-eBook version of the anthology. You can download a free Kindle app that works on most devices from Amazon's website. Adverbially Challenged Volume 3 contains 100 adverbially-rich stories submitted to Mike’s Not-Entirely-Serious Wantonly-Rule-Breaking Adverb Writing Challenge. The challenge crawled from the brain of Mike Scott Thomson, much like life crawling from Earth's primordial swamps millions of years ago, waiting to evolve into something big and quite frightening. This happened while Mike was writing a case study for my website. We were discussing the 'rules' of writing and it all got a bit out of hand. In April 2016, the adverb challenge was launched. In June 2016, we received our 20th submission and the challenge was given its own dedicated website page. In August 2016, we received our 100th story. Adverbially Challenged Volume 1 was published in November 2016. In January 2017, we received our 200th story. Adverbially Challenged Volume 2 was published in March 2017. In November 2017, we received our 300th story. Adverbially Challenged Volume 3 was published in March 2018. 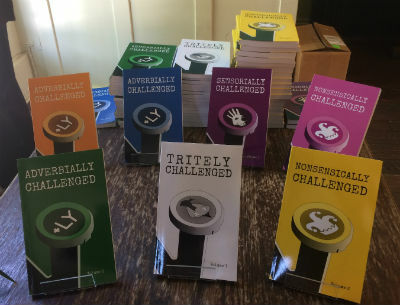 At the time of its publication, Adverbially Challenged Volume 3 was the fifth writing challenge anthology released, meaning the '500 stories published in print' milestone had been reached. 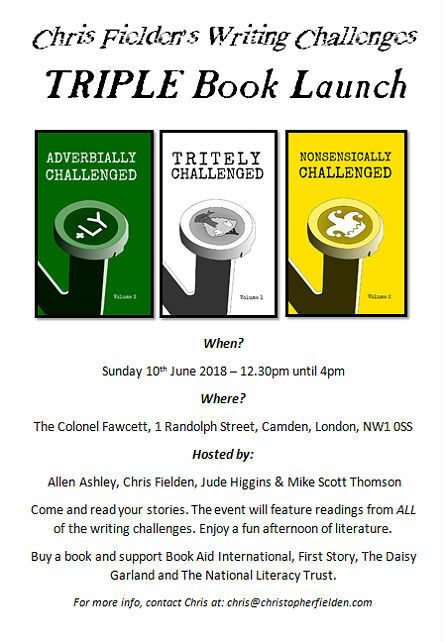 All the writers in Adverbially Challenged Volume 3 submitted their stories to Mike's Adverb Challenge which is one of the many writing challenges run on my website. Abigail Williamson, AJ Gatts, Alan Barker, Alan Pattison, Allen Ashley, Allen Stroud, Amber Fernie, Andrew Ough-Jones, Ann Patras, Arezoo Yazdani, Barb Ettridge, Betty Hattersley, Binyamin Bashir, Catherine Assheton-Stones, Cathi Radner, Cedric de la Nougerede, Christina Dalcher, Christine O'Donnell, Christine Tapper, Christopher Fielden, Craig Anderson, David Silver, David Turton, Deborah Barrett, Elaine Choy, Elena Cairn, Ella O'Loughlin, Emma Franck-Gwinnell, Emma Rogers, Emma Wilde, Etheray, Frank Hubeny, Gavin Biddlecombe, Gemma Masey, Geoff Holme, Giselda Donavado, Helen Combe, Helen Perry, Issy O'Loughlin, Jack Hanlon, Jack Probyn, Jacqueline Pollock, James Hornby, Janet Maile, Jaylen Moulton, Jeanne James, Jeni Bloomfield, Jennifer Stemp, Jennifer Worrell, Jerry Vilhotti, John Notley, John S Alty, John V. Keogh, Jonathan Heriz-Smith, JR Partley, Judith Wolfgang, Julie Indah, Kristie Claxton, Laura Parkinson, Laura-Liisa Klaas, Leese Wright, Len Saculla, Lesley Anne Truchet, Lesley McLaren, Lizzie Merrill, Lorna Caizley, Louise Burgess, Louise Pymer, Lucy Costick, Maddy Hamley, Mark Johnson, Mark O'Loughlin, Martin Strike, Michael Nkansah, Michael Rumsey, Michelle Konov, Mikal Peterson, Mike Jackson, Mike Scott Thomson, Olivia Sandwell, Patricia Mudge, Rene Astle, Richard Lewis, Richard Swaine, RJ Saxon, Ron Brazel, S Collins, Sandra Orellana, Sharon McKenney, Sivan Pillai, SL Hardin, Steve Pomper, Terker Jerbs, Theodore Ficklestein, Tristan Bolton, TS Lanchbery, Valerie Griffin, Vivian Oldaker, William Chris Sargeant and Zoe Bryant. Each and every one of them is a total LEGEND. For every book sold, £1 will be donated to First Story. You can learn about First Story on the about page of their website. You can find details of how much money has been raised via all of the writing challenges on the main writing challenges page. If you'd like to submit a story to the adverb writing challenge, you can do so here. Every story is published. Each time we receive 100 stories, we publish a book. 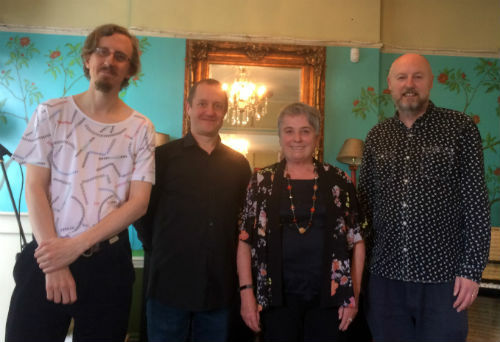 The book launch party took place on Sunday 10th June 2018 at The Colonel Fawcett (upstairs function room), 1 Randolph Street, Camden, London, NW1 0SS, UK from 12.30pm to 4pm. The event was a triple book launch because we also celebrated the launch of Nonsensically Challenged Volume 2 and Tritely Challenged Volume 1. 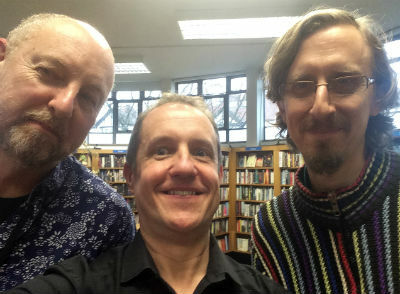 The event was hosted by Chris Fielden, Mike Scott Thomson, Jude Higgins and Allen Ashley. 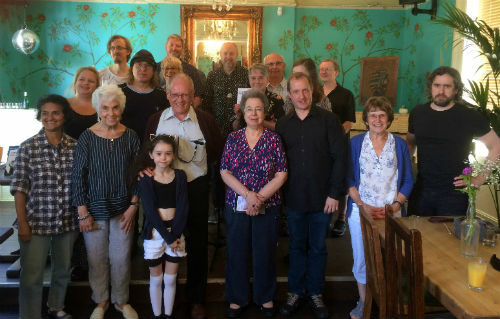 Allen Ashley, Ally Howie, Beena Nadeem, Chris Fielden, David Fielden (who read a story by Scarlett Fielden), Jeanne James, John Keogh, Jude Higgins, Lillia Hammond, Louis Cennamo, Lynn-Marie Harper, Malcolm Richardson, Mangal Patel, Margaret Edwards, Mark Fielden, Marion Turner, Mary Fielden (who read a story by Michael Rumsey), Mel Ciavucco, Mike Scott Thomson and Sandra Unerman. For reference, the poster from the event can be seen below. You can learn more about the launch party, sales statistics and see more photos on the writing challenge book launch page. My extremely handsome (it runs in the family) brother, David Fielden, designed the cover for Adverbially Challenged Volume 3. 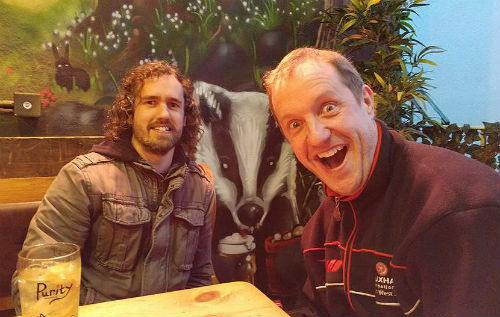 Shortly after the photo above was taken, David Attenborough's Life on Earth camera crew filmed the gruesome demise of the Fielden brothers, who were eaten by a gaggle of extremely rare gargantuan Bristolian badgers. The footage was so disturbing that it has never been shown on TV. Great news, I've submitted another poem to the International Poetry Digest Monthly and they've accepted it once again. It's magnificent. 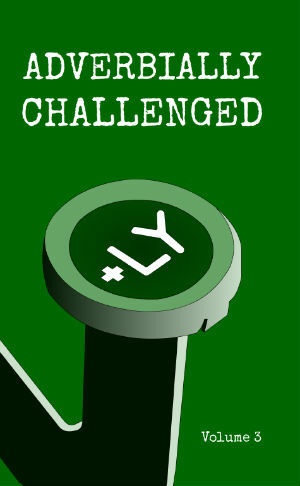 I am unbelievably excited at the incredibly awesome news that I've been selected to appear in the adverbial challenge. OMG! Congratulations, Chris, on another absurd book and in a joyously racing green cover to boot. What more could the lackadaisically undiscerning reader want? I am so honoured to be accountable for 1% of it, that I've immediately put my order in for 3 copies, as I expect to read the first 2 far too quickly. Thanking you muchly, Captain S.
Your 1%ly contribution ultimately left the other vastly bigger 99% to be delightfully filled by other fabulously fantastic authors. Green, for a St Patricks day launch. I wish I could say I planned that cleverly, but in reality it was actually an unlikely coicidence. I'm currently writing a new book called Sharper Lyrics of Broadway. It's a poetry book of songs that will someday make it to the Broadway Theater District in New York City. I'm planning to see my name in lights on Broadway as a playwright, lyricist, librettist and costume designer. New York City is also the home of the New Yorker magazine, so I suggest you submit your short stories to the New Yorker. Hi Rene. I've been submitting my stories to the New Yorker for years. No luck as yet, but I currently have one under consideration with them, so fingers crossed. Hey Chris. I would like to read my story at the book launch if I make it there. I'll be more than happy to read it out loud. That's great, Rene. Let me know if you can make it and I'll add you to the reading list. Hey Chris, I noticed that the adverbially challenged books are only available through Amazon. Have you considered also publishing them on other platforms such as Kobo or iBooks? It would open them up to a wider audience that isn't always reached by Amazon. Just my two cents. I've ordered myself two copies. I'm only starting out in my writing career so this is the first time I've been published anywhere. It feels great to have my first steps be for charity. Hi Tiarnan. Thanks for this. I have considered it, but it means you can't use the KDP Select promotion tools and those work well, which is I why I currently only use Amazon. However, I will look into the others, as time allows. It is now written on my 'to do' list, so thanks for the suggestion. I hope you enjoy the books and congratulations on your first published story - it's always a pleasure and privilege to be able to publish someone for the first time. I hope it's the first of many for you.